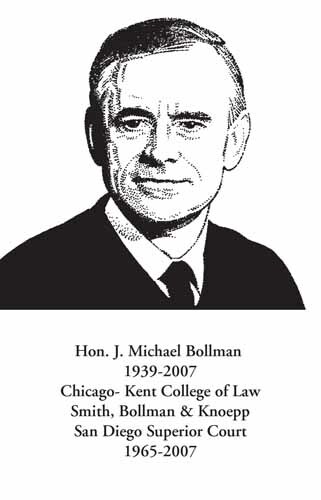 Born April 6, 1939 in Rock Island, Illinois, Judge Bollman graduated from Coe College where he earned a bachelor’s Degree in English before going on to earn his master’s in Journalism and ultimately gradating from Chicago-Kent College of Law. He was admitted to the Illinois Bar in 1965 and the California Bar in 1968 when he moved to San Diego and became a partner at Smith, Bollman and Knoepp. In 1985, he was appointed to the El Cajon Municipal Court, where he served as Presiding Judge in 1989, and was named Judge of the Year by the San Diego Judge’s Association. He was appointed to the Superior Court in 1985 by then-Gov. George Deukmejian where he distinguished himself as a family law, civil independent calendar and settlement judge. Judge Bollman’s civic mindedness was immense, and, among other groups, he volunteered for United Way, The Salvation Army and Lions International in addition to teaching classes in the California Judicial Studies Program and classes at national University. In 1972, the Junior Chamber of Commerce named him Outstanding Young Man of the Year. He was know as a devoted friend carrying with him a list of more than 100 friends, with each entry noting their birthdays, anniversaries and other special occasions for which he always remembered to call and offer congratulations. He was a devoted husband and father and a wonderful friend and respected colleague. His wife Susan, their children Carolyn and Thomas, and brother Brian Bollman, survive him.